All transactions are safe and secure with a reliable history in online purchasing behind each of our associates. 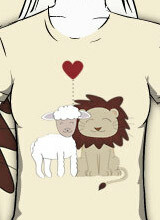 Buy The Lion and the Lamb t-shirt to own Eclipse clothing and merchandise. Whether she is lying around in rainy Forks waiting for Edward to return or scaling trees on his back like a spider monkey, Bella Swan (Kristen Stewart) is only a mere lamb to her lion. This Bella shirt shows the adorable side of their love. It takes a lot to fight off vampires, but they do it better together. Create some action of your own with the Twilight Barbie dolls, including the Bella Barbie, Edward Barbie and Jacob Barbie. This way you can create already existing scenes or change the story to make Jacob and Bella the match made in heaven. The sky is the limit! In addition to The Lion and the Lamb tee above, browse the Eclipse Clothing Gallery for more apparel like men's and women's clothes, kids shirts or hoodies.